This customer asked for our help on the solar panel installation as he was uncomfortable doing it by himself. We installed 7x Zamp ZS170 170W panels (1,190 watts total!) on this fifth wheel trailer with a Midnight Classic charge controller and remote monitor. We also installed a weBoost Drive 4G-X with the antenna rigid mounted on the roof. The internal antenna was carefully routed and mounted at countertop level nearest to an area where cell phone use would be frequent to allow the weBoost cell booster to operate with optimal performance. We covered exposed wiring with split loom tubing as-required and sealed all roof penetrations using Dicor self-leveling sealant. 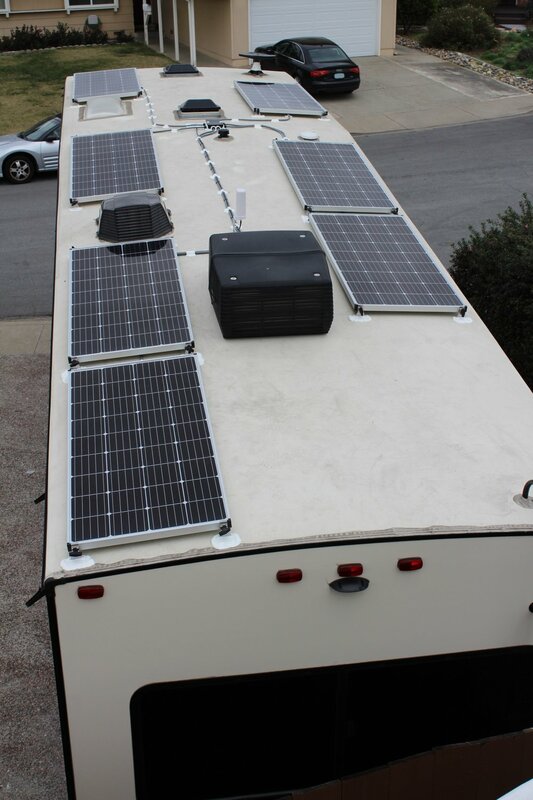 This customer plans to do a lot of dry camping which is what this system will allow. Freedom and the open road powered by the sun!